He wants church doctrine to draw people towards God instead of casting them away in shame. •	He wants to open up Communion to divorced and remarried Catholics. •	He approves of baptizing babies born out of wedlock. He cares about the physical needs of the financially poor. He’s not afraid to tackle economic policies that he thinks perpetuate injustice. His heart breaks for the downtrodden. He emphasizes people over hot-button issues. •	He said he would not judge a priest on his sexual orientation. He strives for a simple life. •	When possible, he chooses modest cars like a Ford Focus over the Papal fortified Mercedes. •	He chose to live in a building reserved for visiting clergy and lay people instead of the plush papal quarters. •	Prefers to wear more humble attire. Francis is keeping his black shoes, foregoing the red cape popes usually wear, and chooses to wear his regular black pants under the robe. He’s also keeping the iron-plated pectoral cross he used as archbishop, and his papal fisherman’s ring isn’t gold but gold-plated silver. He takes risks to care for the poor. •	Sometimes he dresses up like an average priest and sneaks out to give money to the poor living on the streets of Rome. •	He visited the violent slums of Rio de Janeiro and gave an inspiring speech. He humbly admits that he does not have all of the answers. He wants to redistribute the power of the church. •	On January 12, 2014 He chose his first group of Cardinals to reflect his belief that the church must pay more attention to the poor. The 19 men are from Asia, Africa, Latin America and elsewhere, including the developing nations of Haiti and Burkina Faso. Born Jorge Bergoglio, he took the papal name of Francis in honor of a 13th century monk named St. Francis of Assisi who was raised in a wealthy family but gave up worldly goods and lived a life of poverty. Presumably St. Francis’ most quoted prayer is the Prayer of Peace. Pope Francis completely embodies this prayer. Why is Pope Francis So Different from His Predecessors? •	He is the first Pope who is a Jesuit Priest. ◦	In addition to promoting education, they practice Ignatian Spirituality which sees God in all things and all people. This causes them to fight for social justice. ◦	St. Ignatius told his followers to not seek high clerical office in the church. This influence undoubtedly shaped Pope Francis to wear his role with much humility. 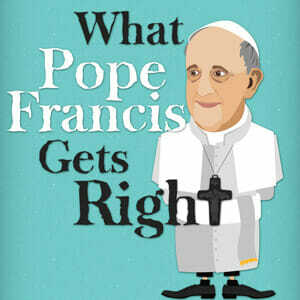 •	He is the first Pope from Latin America. ◦	Latin America is one of the world’s poorest regions. His proximity to poverty undoubtedly influenced him to be an advocate for the downtrodden. ◦	Every Pope for the last 1,272 years has been from Europe. •	He cooks his own meals. •	In his youth, he enjoyed dancing the tango with a girlfriend. •	He trained as a chemist. •	He speaks Italian, German and Spanish fluently, in addition to a smattering of English, French and Portuguese. •	He worked as a bouncer in a Buenos Aires bar to earn money as a student. •	Dec. 17, 1936: Born in Buenos Aires, Argentina, to Italian immigrant parents. •	1957: At age 21, falls gravely ill; eventually severe pneumonia is diagnosed, right lung partially removed. •	March 11, 1958: Enters novitiate of the Society of Jesus. •	March 12, 1960: Takes first vows as Jesuit. •	1960: Studies humanities in Padre Hurtado, Chile. •	1961-1963: Studies philosophy at San Miguel Seminary, Buenos Aires. •	1964-1965: Teaches high school literature and psychology at Jesuit secondary school in Santa Fe. •	1966: Teaches at prestigious Colegio del Salvador secondary school in Buenos Aires. •	1967-1970: Studies theology at San Miguel seminary. •	Dec. 13, 1969: Ordained as a priest. •	1970-1971: Spends “tertianship,” or Third Probation period of Jesuit formation, in Spain. •	1971-1973: Serves as master of novices and vice chancellor, San Miguel seminary. •	1973: Takes perpetual profession as Jesuit. •	1973-1979: Serves as superior of Jesuit province of Argentina and Uruguay. •	1979-1985: Serves as rector of Colegio Maximo and theology teacher. •	June 27, 1992: Ordained auxiliary bishop of Buenos Aires. •	June 3, 1997: Named coadjutor archbishop. •	Feb. 28, 1998: Installed as archbishop of Buenos Aires. •	2001: Co-presides over Synod of Bishops. •	Feb. 21, 2001: Elevated to cardinal. •	2005: Receives second-highest number of votes in conclave that elected Cardinal Joseph Ratzinger as pope. •	2005-2011: Serves as president, Argentine Bishops Conference. •	March 13, 2013: Elected pope by conclave of 115 cardinals.